In a discussion with my son about Government attempts to restrain entry into Australia by boat people, I asked whether, in his law studies, he had come across the Egon Kisch case, which had been part of my studies in Law School days. He hadn’t and it is no longer part of the curriculum. It is an interesting part of Australian history that never seems to get mentioned but it has a lesson and cautionary aspect still relevant today. Egon Kisch (1885-1948) was a Jewish Communist born in Prague, Austria-Hungary. He served in the army in World War 1, deserted and became an author and journalist in Germany as well as a proponent of international communism as the means of best dealing with world problems. He developed a style of reporting known as “reportage”, journalism as a form of social critique intended to arouse public concern. Accounts of his trips to the Soviet Union (1926), the US (1929) and China (1933), from a Communist point of view but with wit and colour, established his reputation as the best reportage journalist in Germany. From 1925 Kisch was a speaker and operative of the communist international organisation Comintern, which was dedicated to the overthrow of the international bourgeoisie. As a result of his experiences and background, Kisch was both hostile to war and fascism and a supporter of communism. It is therefore not surprising that Kisch was a vocal critic of Adolf Hitler and the Nazis, who burned his books in Germany and subsequently banned them. Following the Reichstag fire in 1933, Kisch was arrested by the Nazis and imprisoned in Spandau, followed by expulsion from Germany. He subsequently lived in Paris. Melbourne in 1934, still feeling the effects of the Great Depression, was getting ready to celebrate the centenary of the founding of the city. One hundred years earlier, John Batman had purchased 600,000 acres at what would become Melbourne and 100,000 acres at Geelong from the local aborigines. Two days later he wrote in his journal “This will be the place for a village.” (As a point of interest, the originally proposed name for Melbourne was Batmania). Both conservative and socialist groups saw in the centenary celebrations a means of promoting their respective causes. The conservatives were represented by the Centenary celebrations organisers who saw Melbourne as the “Britain of the Southern Hemisphere". The socialists were represented by the Movement Against War and Fascism (MAWF) which had been established in Australia by the Comintern in 1933. The MAWF organised political rallies and protests against the development of fascism in Europe. A British Royal tour was to be part of the Centenary celebrations. The MAWF proposed to hold an Australasian conference, the All Australian Congress Against War, to coincide with the Royal tour. In addition to speakers from Australia and New Zealand, it was announced that Egon Kisch would speak on conditions in Germany. The announcement that Egon Kisch would be a keynote speaker at the MAWF conference had been made in October. He did not, however, travel to Australia under that name. The local constabulary discovered, via an informant, that one Ewart Risch travelling to Australia as a speaker at the MAWF conference was in fact Egon Kisch. 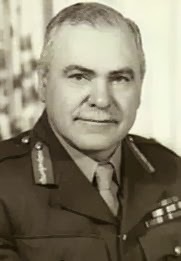 The British Special Branch had notified the Victorian Police Commissioner, Major-General Sir Thomas Blamey that Kisch was a militant Communist. Blamey passed the information on to the Federal Minister for the Interior, Thomas Paterson, who made a declaration under the Immigration Restriction Act 1901 excluding Kisch from entry into Australia. The Immigration Restriction Act 1901 was a Federal Act which limited immigration to Australia and formed the basis of the White Australia policy, a government policy that sought to exclude non-white migrants coming to Australia. The policy favoured English migrants, started with Federation in 1901 and was progressively dismantled between 1949 and 1973. 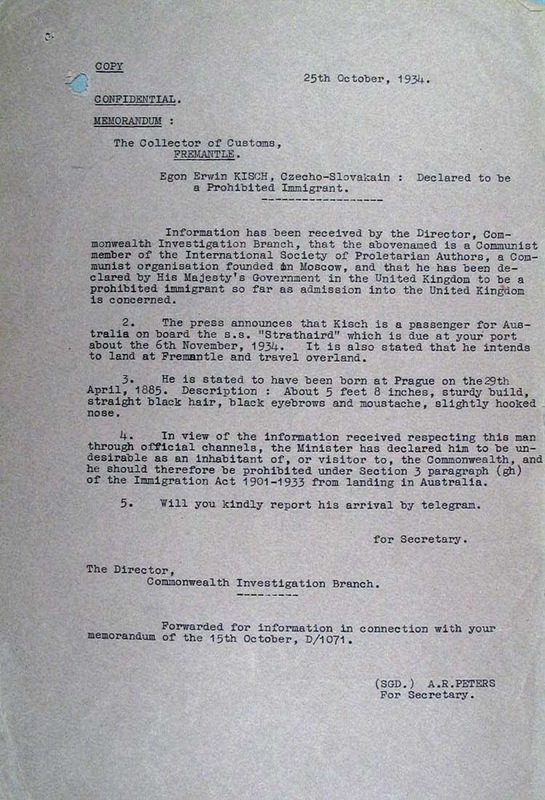 Confidential memorandum from 1934 sent by the Director of the Commonwealth Investigation Branch alerting the Collector of Customs in Fremantle to the prospective entry of Egon Erwin Kisch into Australia. 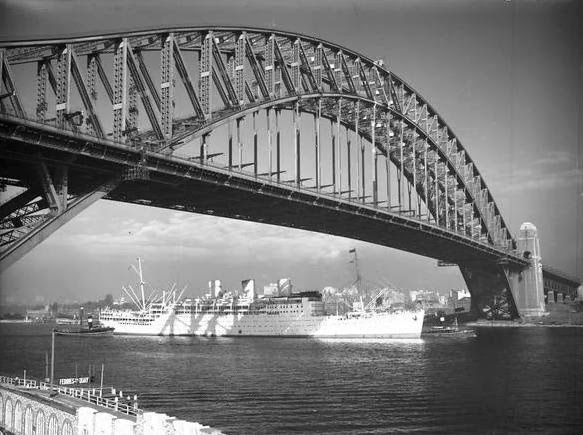 Kisch travelled to Australia aboard the P & O liner RMS Strathaird. Egon Kisch aboard the Strathaird, travelling to Australia. When the liner arrived in Fremantle, Western Australia, on 6 November 1934, Kisch was refused entry into Australia. Federal representatives denied him permission to leave the ship on the ground that he was "undesirable as an inhabitant of, or visitor to, the Commonwealth". Kisch denied the allegation and denied that he was a member of the Communist Party. He was allowed to travel to Melbourne and Sydney provided that he remained in the custody of the ship’s captain, Captain Carter. The liner arrived in Melbourne on 12 November 1934 where it was met by numerous Kisch supporters and well wishers. Acknowledging the greeting and support, Kisch raised his fist whilst on the deck (photo at top). Notwithstanding that a habeas corpus action had been commenced in Melbourne, on 13 November as the ship was to sail for Sydney, Kisch jumped 5 metres from the deck of the ship to the wharf, breaking his leg in so doing. The vigilant Victorian Police quickly dealt with the situation: they picked him up and took him back on board the Strathaird, which sailed to Sydney. The next day Labor MP for Batman, Frank Brennan, rose in the House of Representatives of the Federal parliament and accused the Lyons government of cowardice. 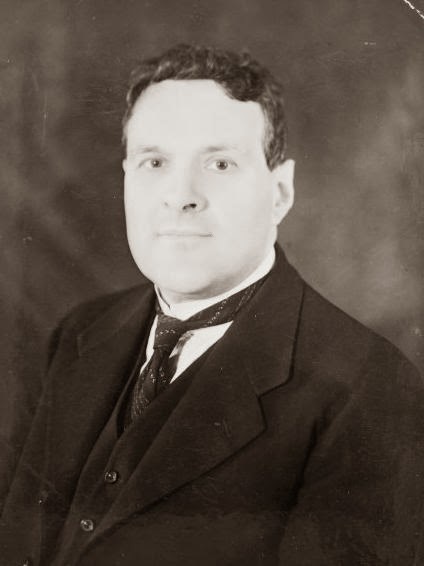 He suggested Kisch's right to speak in Australia was being restricted just because the Lyons administration disagreed with him. In reply, the Attorney General, Robert Menzies, pointed out that every civilized country had the right to determine who should or should not be allowed in, and that, since Kisch was a revolutionary and since revolution involved violence, he was not to be permitted entry. 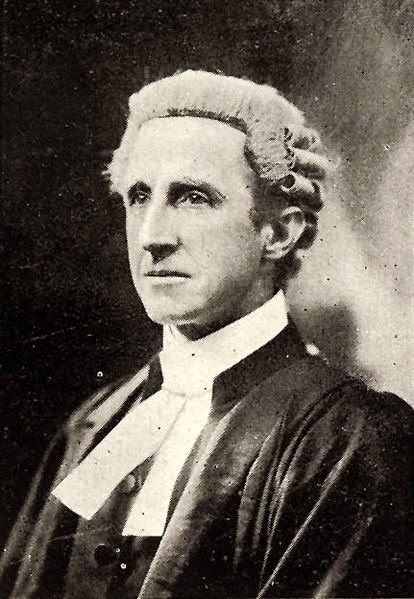 Whilst the Strathaird was on its way to Sydney, Mr Justice H V Evatt of the High Court, sitting alone, ruled that the Federal Government’s attempt to exclude Kisch was defective and incorrect. This was because the advice from the British Special Branch had not been included in the prohibition order. Kirsch was therefore free to enter Australia. Evatt ordered that when the Strathaird reached Sydney, Kisch was to be allowed to disembark and be allowed to visit Australia as long as he obeyed Australian laws. The Government did not back off. Instead it applied a provision of the Immigration Restriction Act, 1901. As has already been noted, that Act limited immigration and was instrumental in keeping persons who were not white from entering Australia. On occasion it was also used to keep out other undesirables, even if they were white. Of note was a provision of the Act that "Any person who when asked to do so by an officer fails to write out at dictation and sign in the presence of the officer a passage of fifty words in length in an European language directed by the officer" would not be given entry into Australia. The problem for the Government in this scenario was that Kisch was a skilled linguist, proficient in 11 European languages. The Government overcame this by directing him to write The Lord’s Prayer in Scottish Gaelic. He refused to do so and was deemed to have failed the test. He was arrested again, this time by the New South Wales constabulary, and was released on bail. The dictation test was also used to exclude another anti-war activist who had been invited to speak. Irishman (and therefore British subject) Gerald Griffin, had been given a dictation test in Dutch, which he had failed as he was meant to do. In his memoir Australian Landfall Kisch records that Griffin then entered Australia under a false name and popped up unannounced to speak at meeting after meeting, to the consternation of the authorities. The Government’s actions were the subject of another application for habeas corpus to the High Court, this time to the Full Bench. 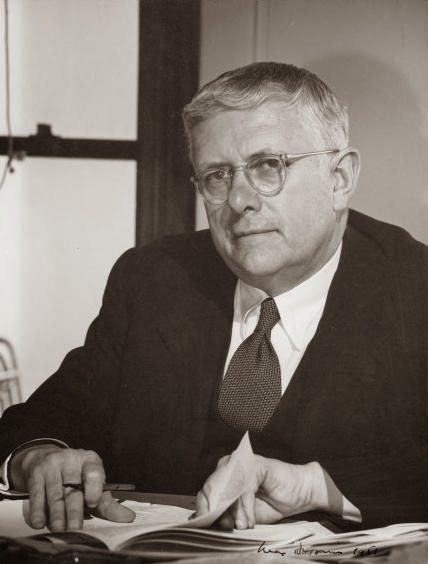 Kisch was represented by Albert Piddington KC and Labor Parliamentarian and MAWF member Maurice Blackburn. On 19 December 1934, the High Court found in favour of Kirsch. It noted that Constable Mackay, who had been born in Scotland and had administered the test, was not actually able to understand the Lord's Prayer in Scottish Gaelic himself. In any case, the Court held, the test was invalid in that Scottish Gaelic was not a “European language" within the meaning of the Immigration Restriction Act. According to Dixon J, the test had to be given in a language recognised as the ordinary means of communication among the inhabitants of a European community for all purposes of the social body. The Gaelic language was simply ‘an ancient form of speech spoken by a remnant of people inhabiting the remote portion of the British Isles’. This view was supported by Rich, Evatt, and McTiernan. Starke dissented. Again the Government attempted to get Kisch off its soil. 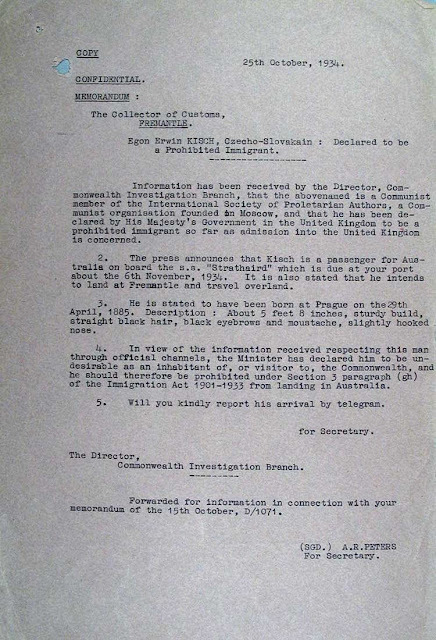 Prime Minister Joseph Lyons contacted the British Government and received the following written advice: "Position is that Egon Kisch was refused leave to land in the United Kingdom in September 1933 on account of his known subversive activities stop permission to enter the United Kingdom would now not be granted to him stop Secretary of State for Dominion Affairs stop"
To this date the “subversive activities” have not been revealed. Robert Menzies on behalf of the government then made a second declaration under the Immigration Restriction Act, overcoming the technical shortcoming which Evatt had found in the first. Kisch was again arrested by the NSW constabulary and, on 21 January 1935, the Central Sydney Police Court convicted Kisch of being a prohibited immigrant. He was sentenced to three months imprisonment with hard labour but was released on bail when his counsel Albert Piddington appealed to the High Court. The matter came before Justice Evatt again, who had heard and determined the first case. Evatt ruled that pending a full hearing, Kisch should be set free. He also pointed out that under the law the Minister had no power to rule on immigration matters after a person had entered Australia and he set up a hearing of the Full Bench of the High Court for March. During the period of his freedom, Kisch addressed numerous meetings, rallies and crowds in Victoria, New South Wales and Queensland, warning of the dangers of the Nazi regime. Egon Kisch addresses a crowd of 18,000 in Sydney’s Domain. "I have had three adventurous months since I last saw you. I know the Police court, the Quarter Sessions Court, the High Court with one judge and the High Court with five judges. But whenever the court let me go I was arrested again. I have learnt to speak English better. Perhaps I do not speak King's English but it's Kisch English anyhow. I did not come here to tell there is terrorism in Europe. I come here to tell you how to stop it. I have been an eye-witness. I was arrested the day the Rechstag was burnt down by Goring and his lieutenants. I saw my friend,Erich Muhsam, the poet, whose works I translated, made to walk naked, even in winter, and to lick up the spittle of his captors. All his limbs were broken gradually, and he died." Electing to cut its losses, the Government proposed a deal to Egon Kisch: to remit Kisch's sentence, stop all legal proceedings and pay Kisch £AU450 for his costs in exchange for an agreed exit date of 11 March 1935. Having achieved notoriety above and beyond anyone's expectations, and public exposure of his warnings on Adolf Hitler and the dangers of fascism, Kisch accepted the offer and departed Sydney on 11 March 1935. The incident alerted numerous Australians to the fascist threat and ways of combating it, and led to the formation of the Australian Writers' League. Kisch's account of his experiences, Australian Landfall (London, 1937), was a lively, entertaining addition to his long list of publications. Back in Europe, he took part in the Spanish Civil War. After the Germans occupied France in 1940, he found refuge in Mexico until he returned to Czechoslovakia at the end of World War II. His draft for a large book on his native land remained unfinished. He died of a stroke on 31 March 1948 in Prague and was cremated. With such a wealth of facts and material, was my study of the case by reason of Government excess? Fairness and proper procedural practice? Habeas Corpus? It was none of the above, the case instead being part of a study of contempt of court. Numerous expatriate Scots wrote to newspapers to condemn the judges for ruling that Scottish Gaelic was not a European language. Exception was particularly taken to Dixon J's comment that Scottish gaelic was "an ancient form of speech spoken by a remnant of people inhabiting the remote portion of the British Isles." The controversy brought with it various collateral rulings. Indignant Scottish patriots wrote letters to the press protesting the High Court's supposed denigration of Scottish culture. A letter written by Mungo McCallum, Chancellor of the University of Sydney, under the pseudonym Columbinus was particularly vitriolic, contending that members of the High Court had made themselves ‘dictators of all language and above linguistic facts’. In R v Fletcher (1935), Evatt dismissed an application to have the editor of the Sydney Morning Herald punished for contempt of court. R v Dunbabin (1935) shows that the editor of the Sun was not as fortunate. He was fined for asserting that the law that was intended to keep Australia white was in a state of suspended animation owing to the ingenuity of ‘five bewigged heads’ who had managed to discover a flaw in the Immigration Act. ‘To the horror of everybody except the Little Brothers of the Soviet and kindred intelligentsia, the High Court declared that Mr Kisch must be given his freedom’. In Griffin v Wilson (1935), the High Court quashed the conviction of another delegate to the Anti-War Congress for lack of evidence. This has been another Great Moment in Law and Politics. Reader Comment and More About Dead Cats . . . Expressions I hate . . . Some more fruit carvings . . .